In order to understand why I have chosen to use zero-waste patterns as a design constraint, I decided that this weeks garment would use a conventional paper pattern. I thought I could make a garment with a very visual representation of how much fabric is wasted in clothing construction. I feel like I should also take a moment to give a little history of my design experience. I studied fashion design at Parsons New School of Design as well as at Alberta College of Art and Design. All the while, getting a B.Sc. in Astrophysics at the University of Calgary. 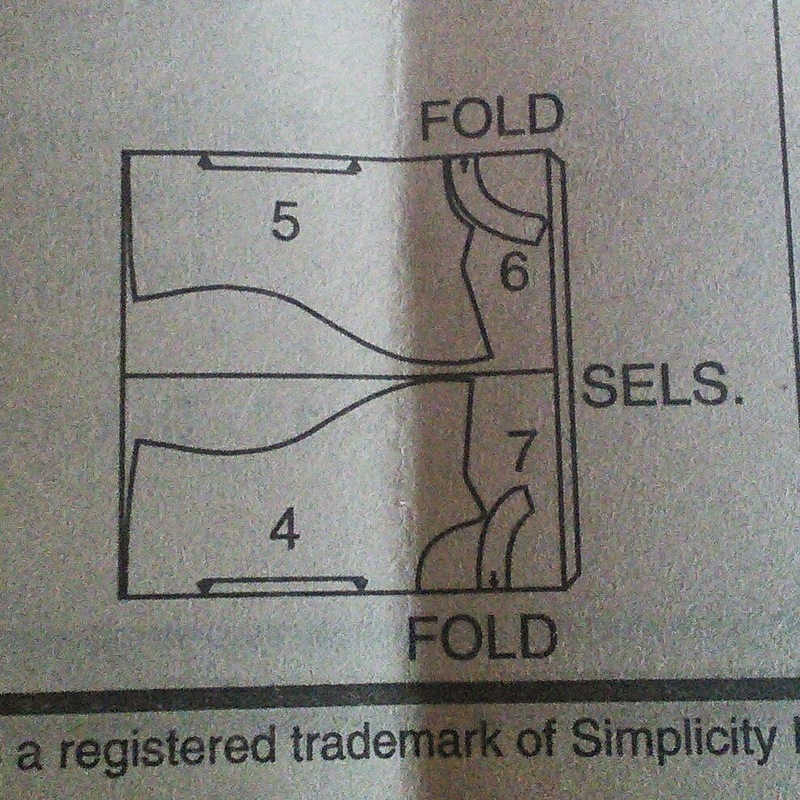 Now this might be confusing, and well, it is! Or it has been, but despite the joke that I can design spacesuits, I do see the parallels between design and science. I have had the pleasure to work as a designer, creating the label Lola, for Polkadots and Moonbeams, reworking vintage clothing into new creations. I also launched a line of hemp yoga clothes with my sister with the name Soham. "Some say that when a child is born it cries Koham-Koham which means Who am I? That is when the universe replies back Soham. You are the same as I am." It is a comforting thought to identify with the universe, particularly as an Astrophysicist. This weeks garment uses Simplicity pattern 5508, top B. This pattern requires 3/4 yards of fabric, therefore I have an additional 1/4 yard plus of fabric to incorporate into the final garment. I cut out the pattern as per the layout instructions, using the largest size as my organic cotton and hemp fabric does not have any stretch. 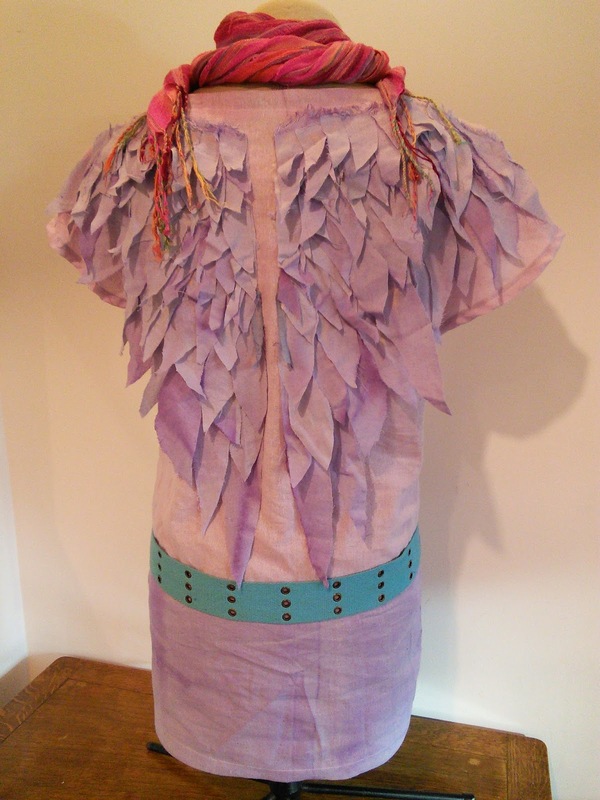 In order to differentiate between the Simplicity pattern garment and the remaining waste fabric, I added colour. Using red cabbage and alum as a natural dye, the resulting colour was purple. 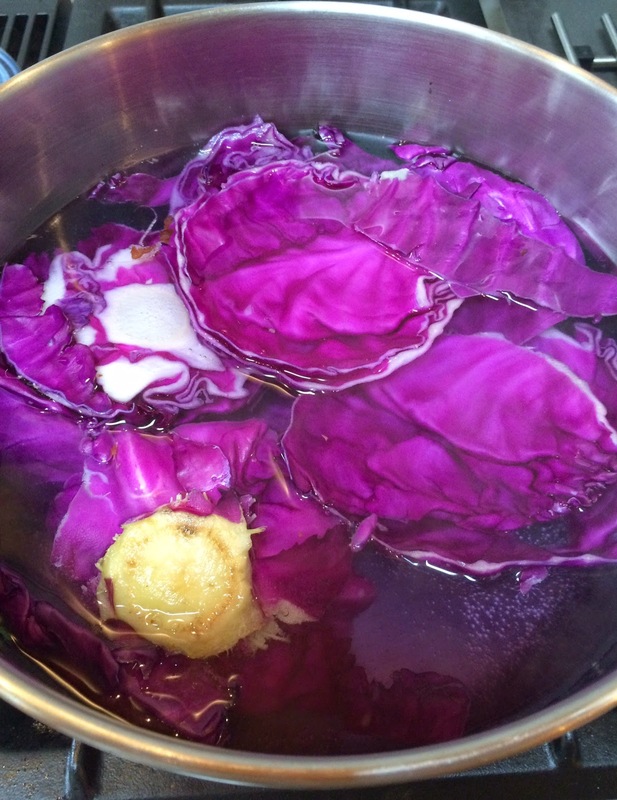 With the addition of vinegar, the cabbage dye turned pink. I am amazed with the range of colours that a small amount of cabbage and a shift in pH can produce. This is certainly a technique I will use again. For this garment, the fabric cut out of the paper pattern is pink. All of the "fabric waste" is purple. 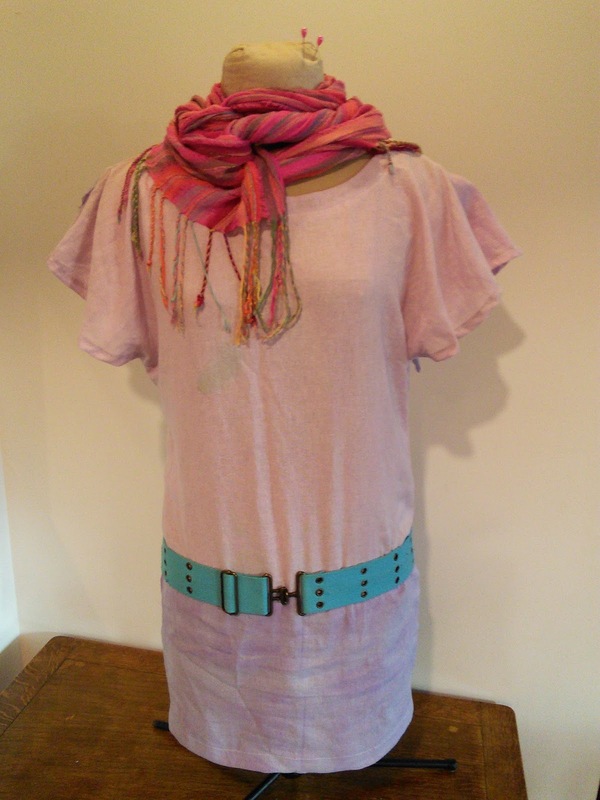 Extra length was added to the pink top with a wide purple band. 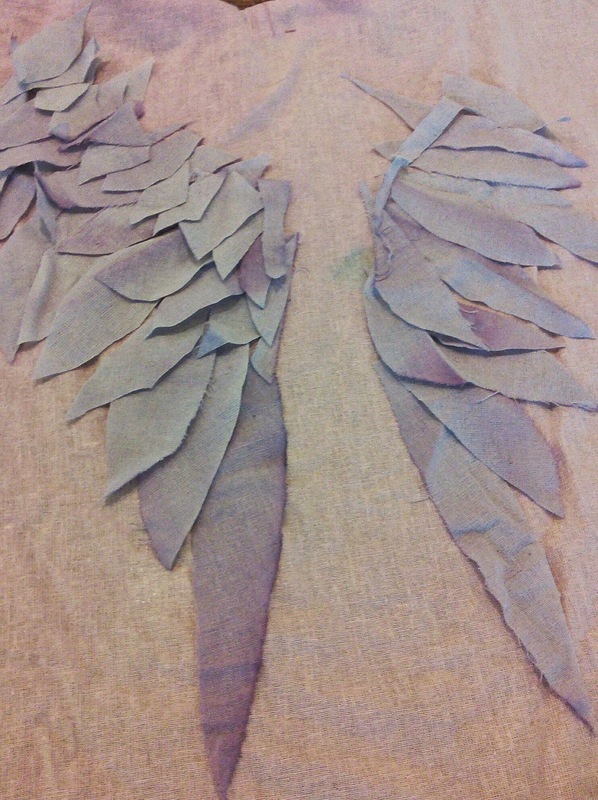 The remaining purple fabric was cut into feathers. This was an organic shape that could lend itself well to the odd bits and pieces left over. In typical garment construction, the average amount of fabric waste is 15%. 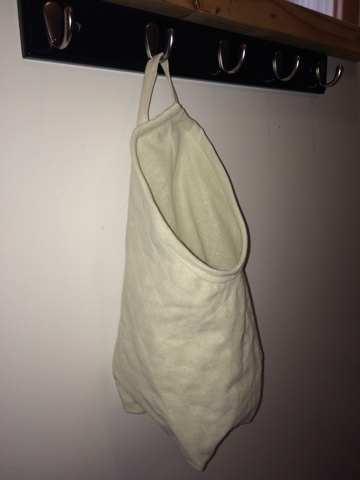 This is a significant amount when "attached" to the garment as can be seen in the final garment photos above. The final garment is almost medieval in its appearance. Although this was not the intended outcome, it is almost ironic given that the traditional approach to garment construction could be considered medieval in its thinking. Similarly, the wings, constructed out of the left over fabric, could be symbolic of hope, that garment construction can become more sustainable. The question that follows is; what needs to change in traditional garment construction to incorporate a more sustainable approach to production? There are many answers to this question but what are we, as consumers, willing to change? "Queue in the slow fashion movement. For an industry that churns out fashions after fashions at the speed of consumers’ changing tastes, slow fashion is an oxymoron. Plain and simple, slow fashion promotes high quality versus fast production, durability versus design for obsolescence, and mindful consumption versus over consumption."